With a long, long history rife with wars and massacres, Irish land is bound to have a few ghosts here and there. That is, assuming you’re a believer in the paranormal. From castles to beaches, here’s a list of our top 10 supernatural destinations in Ireland. Spanning the country, these destinations are supposedly haunted by ghosts of all sorts – soldiers, brides, court jesters and more. On the edge of Lough Lane in Killarney, Co. Kerry, this five bedroom stone castle built in 1536 is currently run as a B&B. 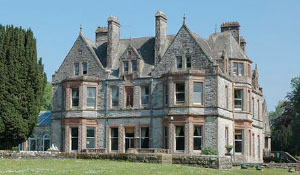 Visitors have reported supernatural activity both inside and outside the castle. Apparently every May Day for hundreds of years, a medieval knight named O’Donoghue rides along Lough Lane past the castle accompanied by a group of spirits who play music behind him. Inside the castle, visitors have reported waking up in the middle of the night to sounds of screams or doors repeatedly opening and slamming shut. One of the spirits is believed to be Myles ‘the Slasher’ O’Reilly, an Irish folk hero who spent his last night in Ross Castle before dying in battle in 1644. 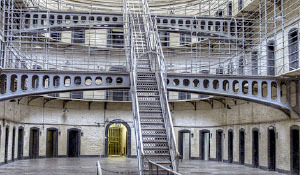 Famous for its political prisoners or Easter Rising leaders like Padraig Pearse, James Connolly, Charles Parnell, Eamon de Valera and others, Kilmainham Gaol is supposedly full to the brim with spirits. Many died (some were executed) in the prison, which is now a popular museum. Not only are there ghosts of former inmates floating about, but seemingly there are plenty of prison warden spirits, who are of the malevolent sort. 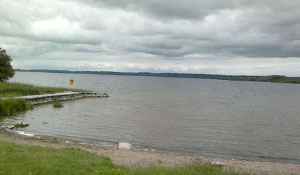 A limestone freshwater lough between counties Westmeath, Meath and Cavan, Lough Sheelin is said to take a life every seven years. You can ask the Local Civil Defense Volunteers who’ve gone out to fetch the bodies from the lake on a few occasions. Sabrina is a ghost that’s well known in the area. The story goes that her lover drowned while the two were crossing the river as they were eloping. She still hangs around in search of her lover, and visitors of the nearby Ross Castle (#1) have reportedly had close encounters with her. 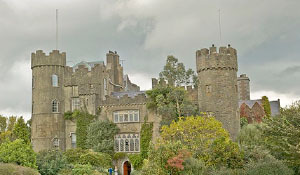 King Henry II of England built Malahide castle for his dear friend Sir Richard Talbot in Malahide, Co.Dublin in 1185. One of the oldest castles in Ireland, Malahide castle is apparently haunted by at least five ghosts: Walter Hussey, Miles Corbett, Lord Chief Justice and his wife Maud Plunkett, but most notably the castle’s jester, Puck of Malahide. Word got out that Puck had fallen in love with one of the prisoners, Lady Elenora Fitzgerald, and within days he was found mysteriously stabbed to death outside the castle. As the story goes, with his last dying breath, Puck made a promise that he’d haunt the castle – apparently he stood by it. There have been quite a few sightings of the jester’s ghost and he often appears in photographs. When the castle was being sold in 1979, there were several reports by potential buyers of the jester’s spirit roaming about. 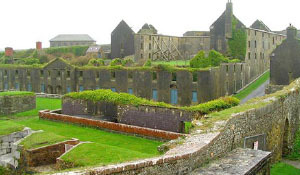 A wedding and three funerals: the story of Charles Fort (near Kinsale) is quite the tragedy. It’s famously haunted by recent bride Wilful Warrender – she flung herself to her death from the fort wall after her groom was killed on the night of their wedding. To make matters worse, her father is the one who shot him. It was during wartime, her father was under the impression that her husband was an intruder. Grief stricken by his daughter’s suicide, he shot himself. Warrender is called “the White Lady” by locals because whenever she’s sighted, she’s in her wedding dress. She’s often found by children as she wanders around the town of Kinsale where she grew up and she gives them a wave. Usually she’s quite friendly, but there have been reports of people in the fort being pushed down the stairs by her spirit. The Dingle Peninsula, one of the most picturesque places in Ireland, actually contains quite a lot of history, and apparently some ghosts as well. 1580 had the Siege of Smerwick: a Spanish force of about 400 soldiers (close allies to the Irish) was defending Ireland against the British during what was the Second Desmond Rebellion. 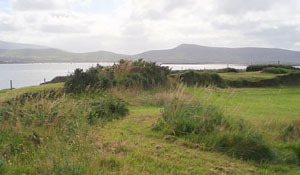 They retreated to Dún an Óir on the Dingle Peninsula, and were then besieged by the English army, who massacred the whole fleet and left them on the shore without burial. Today, Dingle locals and visitors claim to hear Spanish cries, see occasional skeletal remains on shore or in the ocean, and smell the stench of rotting flesh coming in with the gusts of wind. It’s like the Phantom of the Opera, but in Belfast. 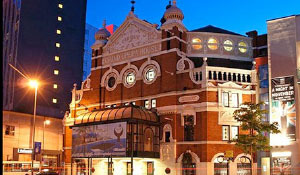 Though the Grand Opera House has been brilliantly restored in recent years, plenty of actors and stagehands have claimed to have seen a face staring at them through an outside window, a figure wearing a long black robe, and have also had a strong sense of being followed when alone on stage. Just ask the Northern Ireland Paranormal Research Association, who’ve made direct contact with deceased stagehands George and Harry, as well as an unnamed cleaner and another unnamed electrician. 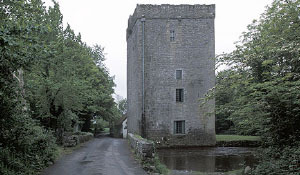 A fortified 14th century Irish-Norman tower house, Thoor Ballylee once belonged to Lady Augusta Gregory, life long friend of poet W.B. Yeats. 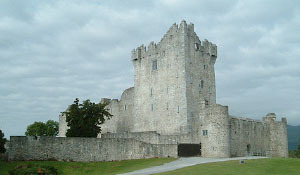 She passed it onto the famous poet, and he spent many a summer living and writing in the peaceful tower in rural Galway. Yeats himself believed it to be haunted by a young Anglo-Normal soldier; after Yeats’s death, the tower was turned into a museum, the curator of which felt a spirit as well. He had plenty accounts of an apparition walking up and down the stairs, and his pet dog seemed to feel it too. In 1989, a visitor asked if he could photograph Yeats’s old sitting room, and the developed photograph contains a clear human figure (albeit blurry and black) in the picture that hadn’t been in the room at the time. Though today’s connotations of Castle Leslie in Co. Monaghan are along the lines of a modern spa or hotel or fancy cooking school, it’s apparently fairly well haunted. Each room is – or has been – home to an apparition, the most famous of which is the Red Room, where soldier Norman Leslie’s ghost appeared in front of his mother Lady Marjorie in 1914 just a few weeks after he’d been killed in battle in France. She recalled him appearing in a cloud of light, sifting through a pile of letters. When she addressed him, he smiled at her and then faded away. If you start to hear faint whispers upon entering Saint Michan’s Church in Dublin, they’re probably coming from the mummies in the crypt below. 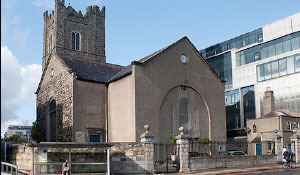 Many of Dublin’s most influential families between the 17 and 19 centuries are interred there, as well as a famous thief and nun, the Shears brothers who were executed by the British in 1798, and many more. There have been some visitor accounts of ‘whispering mummies’ in the crypt. Recently, a woman peered into an unexcavated section and suddenly became aware of many voices around her. On her blog she wrote she had heard “A sort of whispering, murmuring noise, but I couldn’t make out any of the words,” she said. She also felt the passageway becoming rather tight, like there were many people suddenly surrounding her.